Company: Eastern Marketing Services (EMS) has been a leading provider of direct mail solutions in northern New England for over 26 years. In addition to their high-quality of service, Eastern Market Services is able to execute mail programs at an average of 1/3 the cost of their competitors. The result? 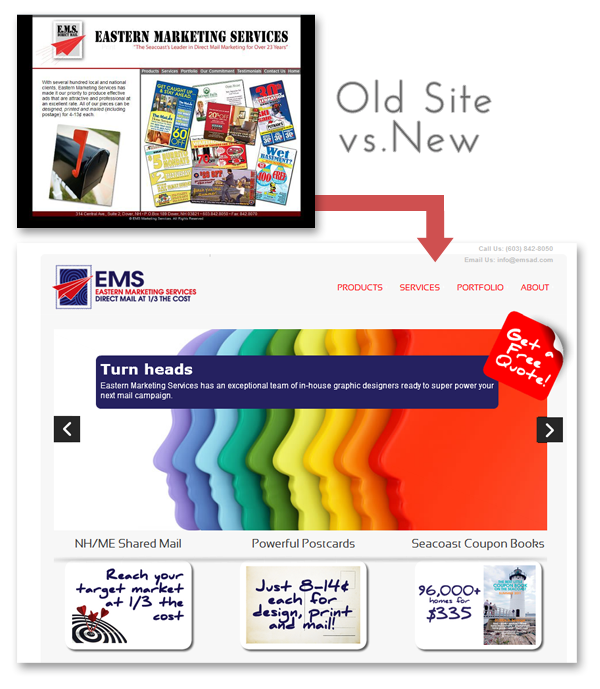 EMS has built up a base of repeat clients who use their products to drive new business. The Opportunity: EMS has over 26 years of direct mail expertise that is powered by a highly motivated team focused on creating results. EMS has several key differentiators that have lead to a successful track record of happy clients. When meeting with clients in-person, EMS has always been able to clearly articulate their unique selling points and value propositions. However, EMS has never had a strong web presence, or a “silent salesperson” to tell their story via the internet. Looking to tell your story more effectively using the Internet? We would love to learn more about your brand and see how we can take it to the next level. Please feel free to drop us a line or contact us at anytime!